Whilst flicking through one of my favourite interiors magazines (LivingEtc), I stumbled upon a picture of a bright yellow Dolce and Gabbana handbag with a big red watermelon graphic on it. What it was doing in an interiors magazine, I don’t know! Anyway, it caught my attention and sparked an idea for this upcycled leather bag. Yonks ago I’d picked up an old leather briefcase/bag from a charity (goodwill) shop for a couple of pounds with the intention of upcycling it. Even though the bag was from the ’50s or 60’s it was the perfect size for a laptop. The bag had been gathering dust in my loft and I’d almost forgotten about it until now. I wasn’t going to try and turn it into the Dolce and Gabbana bag. 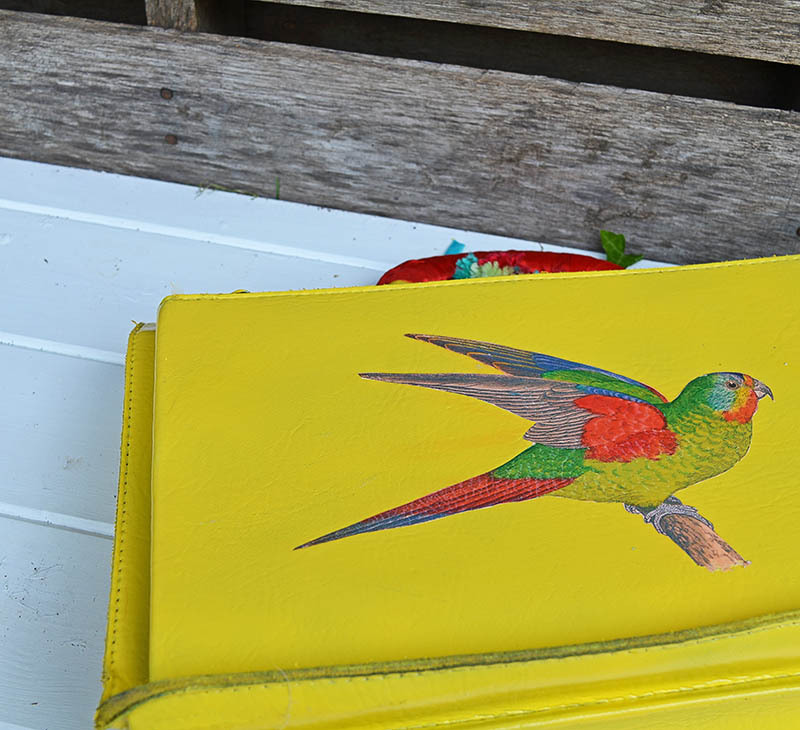 However, the designer handbag gave me the inspiration to use bright yellow paint and vintage graphics to make my upcycled leather bag. I don’t often work with leather so I got to experiment with painting leather and transferring images onto it, which was great fun. 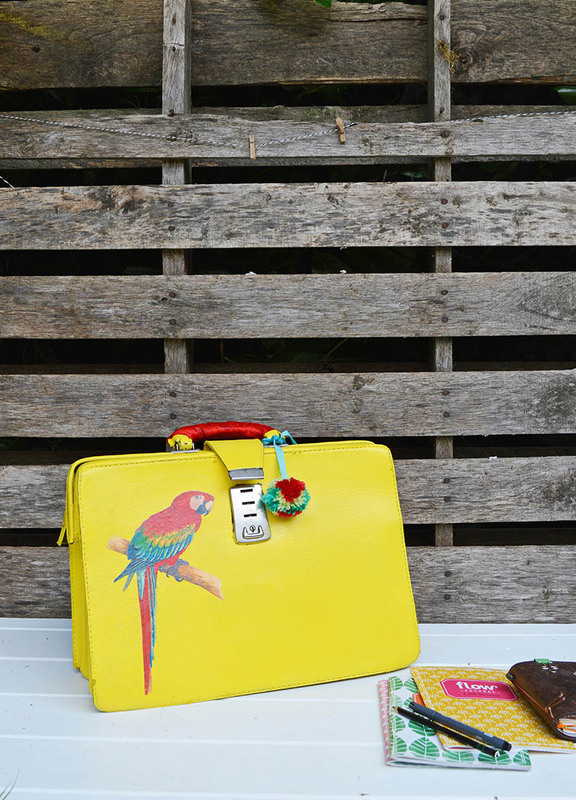 I’m so happy with how my brilliant bright upcycled leather bag turned out. 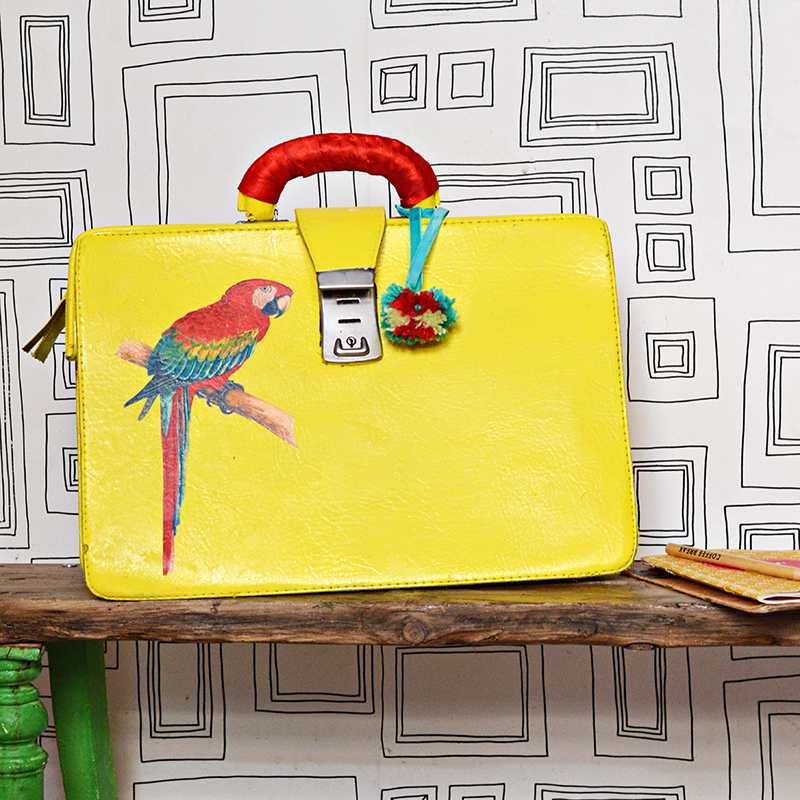 It’s got to be the brightest laptop bag in town. There will be no danger of me losing it as you can spot it a mile away. It will definitely stand out at the next conference or meeting I attend. 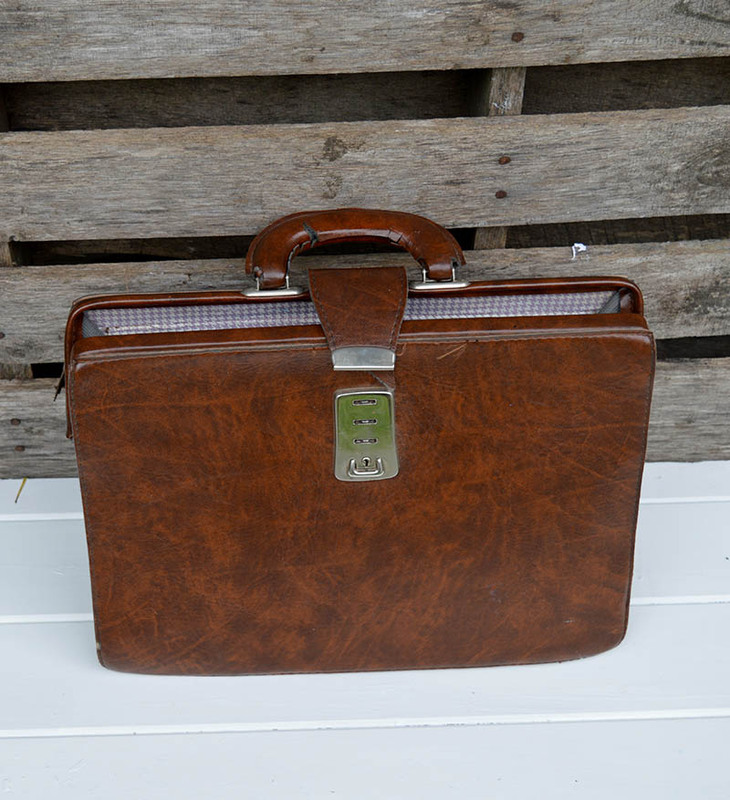 Old leather bag – Mine was from a charity shop, these bags were very common in the 50’s and 60’s in fact mine was just like the one my Grandma took to work. Vintage graphic – Try Remodelaholic for lots of free vintage graphics. 1. Firstly, cover the areas of the bag that you don’t want to be painted with painters tape. 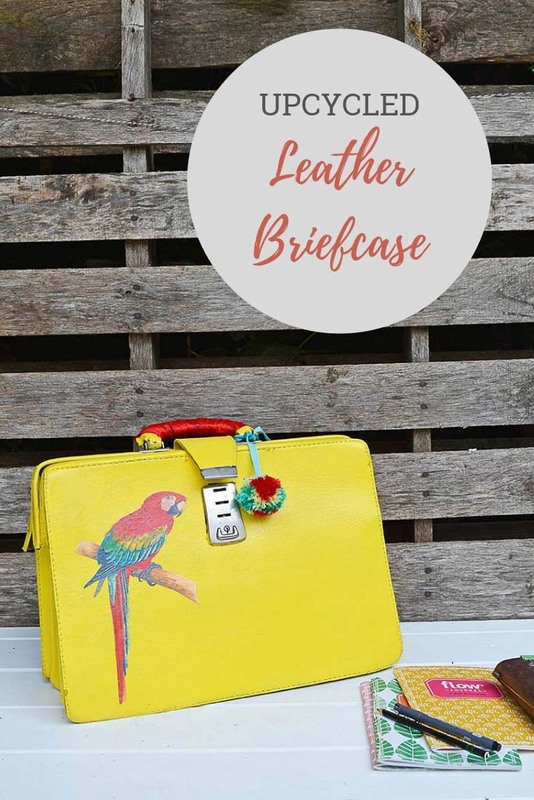 Such as the metallic areas of the buckle and zip. Work outside whilst spray painting as it can get rather smelly. 2. Next, before spray painting the leather use a primer to make sure the paint will stick. 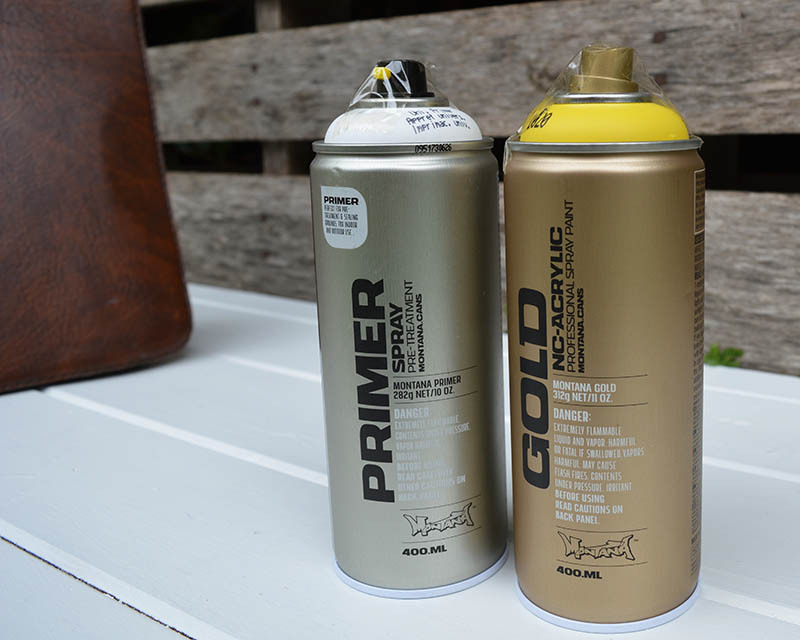 Spray the bag all over with a primer such as Montana Gold universal primer. 3. Once the primer paint has dried then spray the leather bag with the colour you want. I used Montana Gold Citrus paint. Cover the leather bag in two coats, let the paint dry fully between coats. 4. I downloaded the macaw graphics from the internet. If you look there are lots of sites where you can download royalty free images to use for crafting. 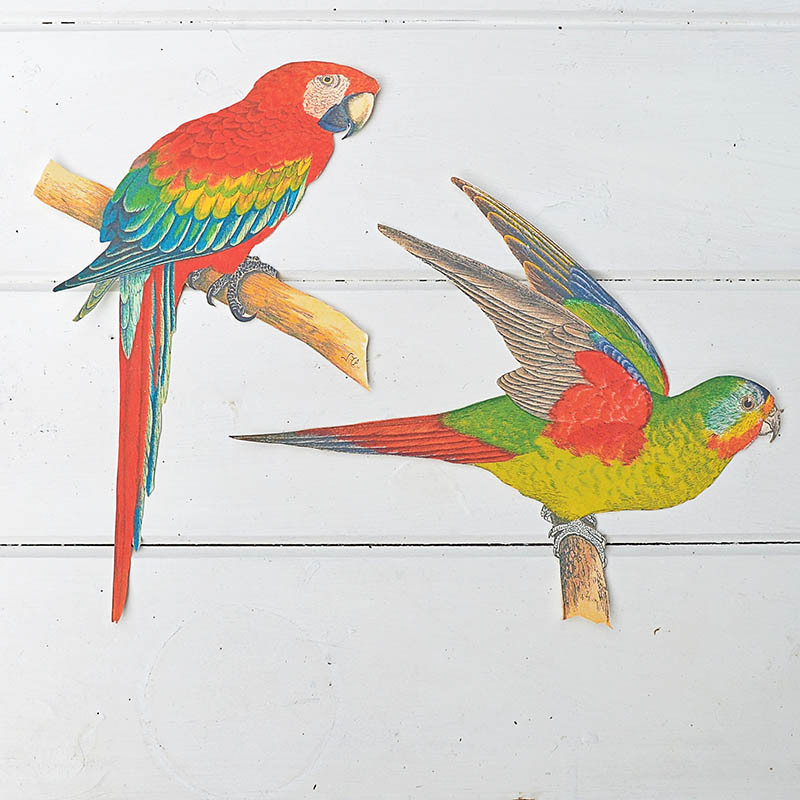 Pictureboxblue has a good collection of parrot paintings you can use for free. 5. Print your chosen images onto the dark t-shirt transfer paper. 6. 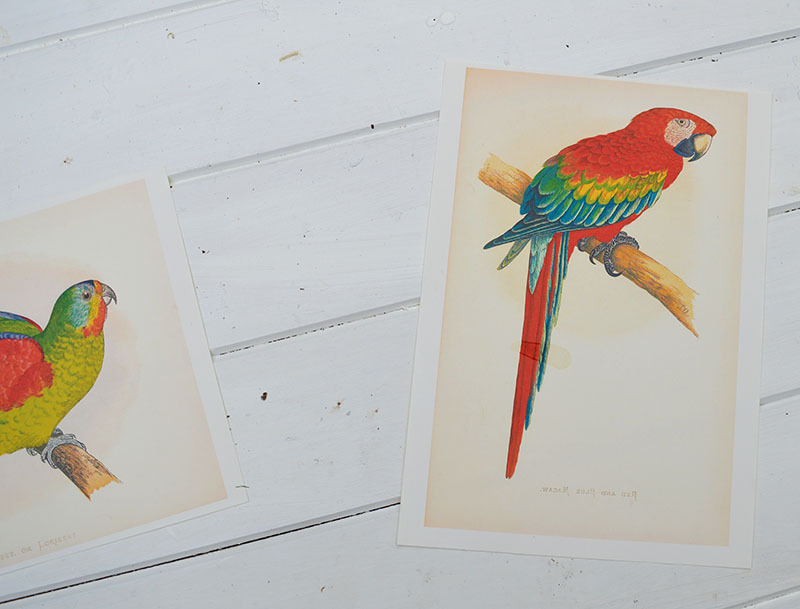 Next, carefully cut around each printed parrot. Then peel it away from the backing paper. This is quite a tricky delicate thing to do. I find that if you actually peel away the backing paper rather than the image it is less likely to tear. 7. There will be instructions with the transfer paper on how to use it. With the paper I used, the image was placed face up on the bag and covered with wax paper. 8. 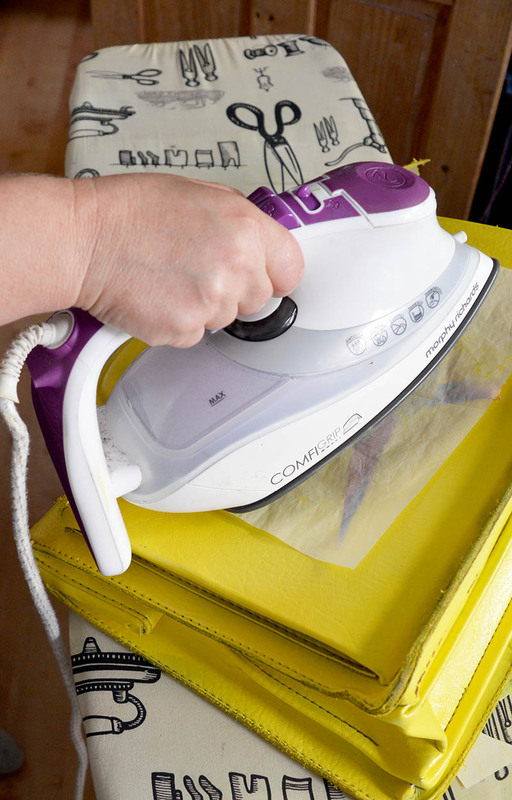 Use a hot iron (with steam setting switched off) to iron the image onto the bag. 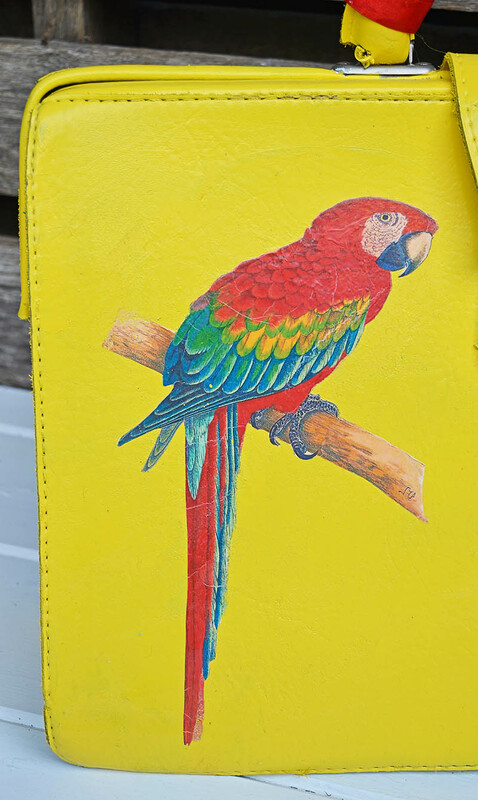 I ironed a parrot to both the front and back of the bag. 10. 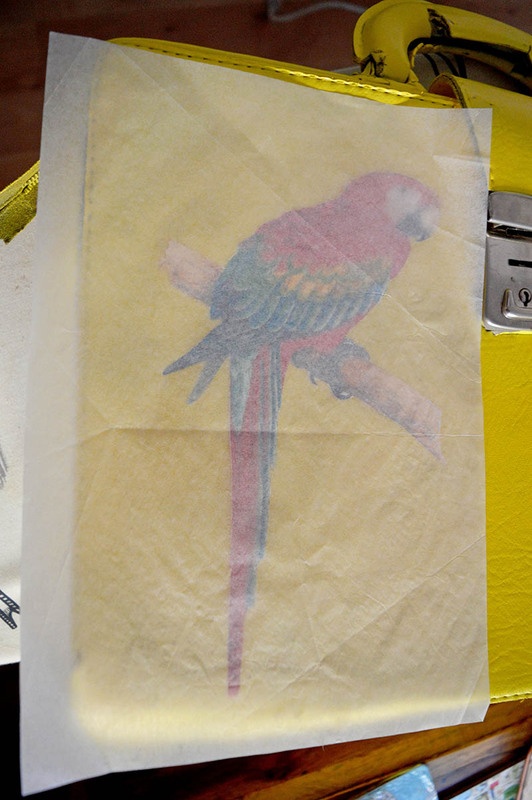 After, the parrots have been transferred to the bag, apply two coats of outdoor Mod Podge. This is to protect the upcycled leather bag from chips and knocks. 11. Finally, the handle was coming unstitched in places so I just wrapped a red ribbon around it. Make a colourful pom pom for a bag charm. 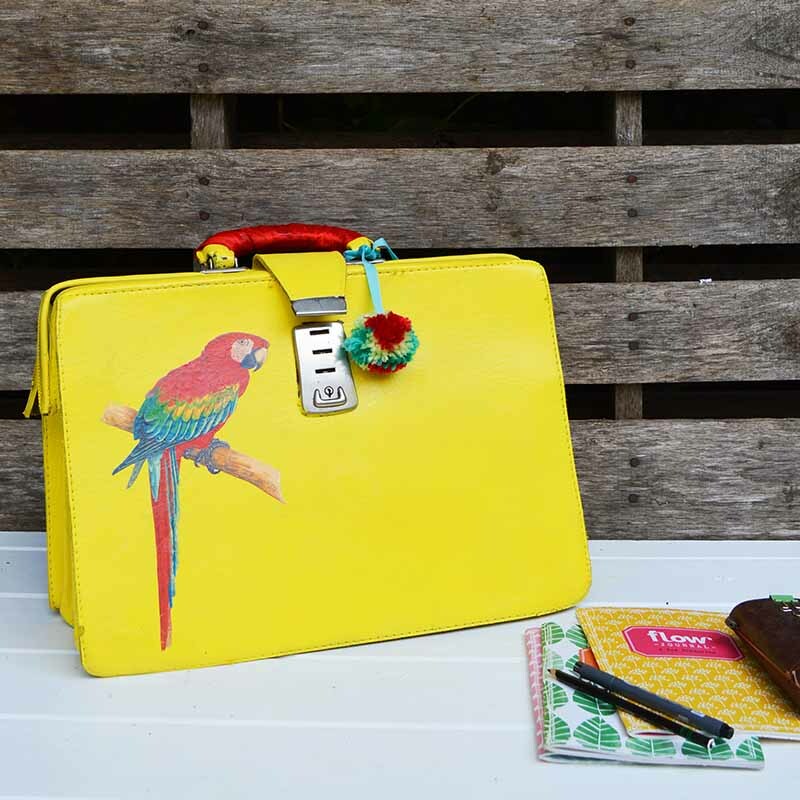 This is just such a happy looking upcycled leather bag. You will see me coming with that bright yellow and red and it is definately a unique one off! 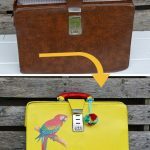 If you liked this post you should check out these other colourful upcycles. Love it Claire, so you and yet a new look! The new banner is fab, good for you, and thanks for sharing on craft schooling Sunday, great to reconnect! Thank you, Sara. I hope you hade a great summer, loving getting back to craft schooling Sunday. I love finding your newsletter in my email..thank you for the ideas and time you take to share them.. Thank you Brenda, that is lovely to hear. I am very impressed with the boldness of this project Claire. And the paint did a fine job of covering up all the dark leather underneath. Who needs Dolce and Gabbana when we have Pillar Box Blue? This is beautiful Clarie, and now I regret giving my old leather bag to the thrift store. Thank you for sharing with us at Celebrate Your Story, and have a great weekend. Thank you, I’m sure there will be another leather bag. That’s gorgeous, I love a bit of yellow. I would have been worried that the heat from the iron would lift of the paint in some way, the fact it didn’t opens up a whole load of possibilities for fancying things up! Thank you Julie. I made sure the grease proof paper covered the whole area where the iron touched and this stopped the paint from lifting. Your new laptop bag turned out awesome Claire! Love the colour you chose and the sweet birdy image! It looks super similar to the Rosellas that we have here in Australia! So pretty! Thank you Sam. I think the bird on the front is supposed to be a scarlet macaw not sure about the one on the back. I liked them as they were so colourful. Thank you, I picked the birds because they were so colourful. I’m here from My Thrift Store Addiction linky party. I absolutely love this make-over. I’m going to pin it in case I find an appropriate item to redo. Thank you for sharing this! Thank you so much I hope you find one. Thank you, Toni. It certainly looks nothing like the one she carried now that I’ve upcycled it. I love that you are using a vintage bag for your laptop! So stylish and I love the bright color. Great tutorial and like everyone else I now see that you can apply a transfer to leather. Thank you, Tonya the transfer worked really well. This bag is so bright and joyful. Adding the parrots is a fun final touch. You taught me a few new techniques in this post Claire. I appreciate knowing how to do this. Thank you Leanna. I just like trying new things. Thank you, Ivory. I just like to give things ago and see what is possible. Love this! I knew you could paint leather/faux leather, but I did not know you could use a heat transfer on it. Great project! Thank you, the heat transfer worked really well. This turned out super cute, Claire! I love the bright colors and the birds are adorable! This is such a cool idea. I had no idea that you could paint leather and then heat transfer on top. 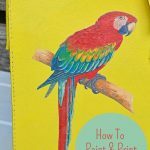 I love the colour you chose and the parrot transfer is smashing as is the pompom. Thank you! I didn’t realise you could until I decided that’s what I wanted to do and then looked into it. I will be transferring more things in the future like this. So cool, Claire! Need to study up on image transfer as that’s new to me and has so many possibilities. Visiting from Grandma’s House party. Thanks, Victoria, the image transfer was really easy for the bag it was an iron on.